Hand-made quality traditional English dovecotes for sale in lots of different sizes, style, colours and designs. Whether you are looking for a decorative, ornamental garden dovecote or birdhouse or a fully functional dovecote we will have something suitable. 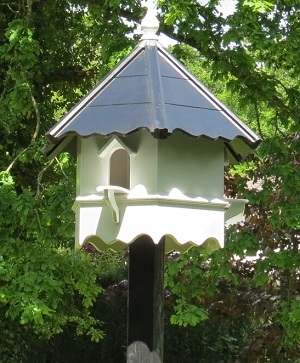 We offer wall mounted dovecotes as well as post or pole mounted birdhouses for all types of doves, pigeons and other wild garden birds. Manufactured from quality timber, these dovecotes will make a beautiful feature in your garden and provide a home for your doves. Our extensive range of dovecotes offers a range of birdhouses suitable for a variety of different doves and pigeons including fantails, wood pigeons, turtle doves, collared doves, stock doves, rock doves etc. Pigeons and doves make up the bird family "Columbidae", which includes around 310 species, there is no strict division between doves and pigeons. They have round, stout-bodies birds and short necks with small rounded heads, short slender bills, tapered wings and short, scaly legs and they make cooing calls. Their main diet is seeds, fruits, and plants. If you would like help or advice on keeping doves, please feel free to call us.